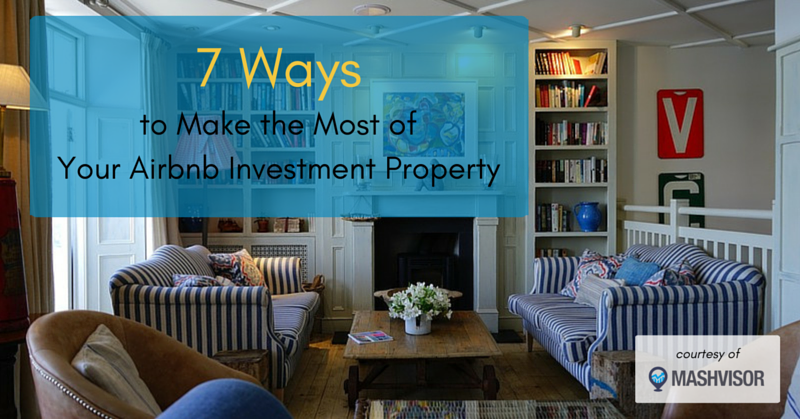 Making the most out of your Airbnb investment property means doing everything you can to maximize returns. This means not only being aware of the finances that come with a vacation rental, but also how to appeal to travelers to keep them coming and paying. Here are 7 ways to ensure you’re getting the most out of your vacation rental property as you possibly can. 1. Research average rental income & occupancy rates. Before buying a vacation rental investment property, have an idea of the expected returns and if the area actually receives traffic from Airbnb users. You can do this by searching Airbnb investment properties and find the average rental income in an area and the predictive analysis of a property. Look at the average Airbnb occupancy rates and how each property type correlates with occupancy rates and rental income. For example, if one bedroom is added to the property, then occupancy rate and income go up by X.
You’ll also be able to view how other properties are performing. This is another great way to understand the potential of your Airbnb investment property. See bookings, reviews, descriptions, features, prices, seasonality trends, and more. The beauty of Airbnb is being able to stay at a unique property every time and everywhere you travel. Don’t let your property be a boring cliché. You can avoid making your vacation rental dull by giving it its own identity and charm. If there are weird paintings or a displayed collection of Beanie Babies, keep them! The uniqueness adds to your guests’ experiences. With that being said, make sure you can provide guests with anything that will enhance the experience. If you have great features in your home, add some highlights to show them off. For example, a sign on the balcony window that says “Beautiful Sunsets Are Enjoyed Here” is a memorable accent in your property and will get users excited to use the balcony. Finally, include all those amenities guests love – towels, laundry detergent, shampoo, etc. Try being your own guest and provide all the amenities you would expect to find. Get users to remember you property so they can keep coming back and leave positive reviews. 3. Create a strong profile and ask for positive reviews. A profile is the apple of the user’s eye. Create a salient profile with professional photos, detailed features, and clear rules. Photos are the most crucial factor in getting bookings. The photos should help the traveler envision themselves using and enjoying the property. Make sure to include photos of the entire interior and exterior of the property, but don’t stop there. Take photos of the cup of coffee and book next to the fireplace. Take photos of the views. Airbnb offers free access to professional photography, so take advantage. Your profile should be very clear in terms of rules and what is provided in the property. Include a picture and description of yourself. The more transparent the profile, the more comfortable the guests will feel. After inspecting the profile, the reviews are the next most important thing. Believe it or not, the number of reviews is what increases occupancy rates, not necessarily the ratings. The more reviews you have, the more relieved users will feel knowing so many people have stayed at this property. Your SEO ranking also goes up, which means your listing will be closer to the top of a search page. Don’t misunderstand – positive reviews are crucial, but multiple good reviews are better than one outstanding review. 4. Set the right price. If your listing is new to Airbnb, make sure to not set high prices from the get-go. People are less likely to pick a new listing with no reviews; high prices will make them even more reluctant to do so. Start by charging comparatively lower prices and when there are reviews that vouch for your amazing service and property, start raising your rates. It’s customary to take advantage of peak season to maximize returns. During weekends and holidays, raise your prices. If you’re not getting booked, your prices are too high. If you consistently have a 100% occupancy rate, your rates are too low. Don’t lose returns on your investment property because of poor pricing strategies. 5. Clean. . . Spring clean! Isn’t it a shame when a guest is disturbed because the toilet was overlooked or neglected? When it comes to cleaning, be meticulous. Dust every nook and cranny and clean the bathrooms twice. You don’t want to lose income or positive reviews just because the property was not properly cleaned. You can always hire cleaning services like MaidThis! to ensure turnover is completed in a timely, efficient manner. We’ll be sure to take care of areas guests pay attention the most and how to exceed their expectations. We’ll even let you know when you’re running low on supplies. 6. Location, location, location. Get the best or fake it til’ you make it. Location is the #1 most important rule in real estate and in having an investment property. You can search for top Airbnb neighborhoods and cities but you want to make sure your property has proximity to all the sought-out attractions. With Airbnb travelers, they care about getting to the best amenities and having access to public transportation. If you have an optimal location, you can also use that to your advantage when pricing. If the location is less-than favorable, then make the property spectacular. Also, tell travelers about what they can enjoy in that particular area. Maybe the property is not downtown, but it might be close to a park or restaurants. Give as much detail as possible and be honest about how far away attractions are. Remember, that also means the rates have to be very reasonable. 7. Get verified and sort out legal stuff. Getting verified as an Airbnb host and accepting guests that are verified will help in getting more bookings. Users will know reviews aren’t phony or fake if they’re coming from verified guests. Make sure to know the rules and regulations for owning a short-term rental property in your city. These rules may mean you have to obtain a license, a registration number, or pay certain taxes. If you’re not legal, your listing could be banned from the site, result in fines, or cause you to lose your investment all together. Better to be safe than sorry! Joining the world of Airbnb means meeting people from all over the world and making a great investment. There are plenty of resources out there to help you follow these tips. Remember as an investor, due diligence about the right kind of property, pricing, and location is crucial. As a host, communicate well, be hospitable, and have fun! This blog was written by Mashvisor, a real estate analytics platform that enables real estate investors to easily find and analyze Airbnb and traditional investment properties.